‘Do you want that bread sliced?’ says my local baker most weekends. It’s a weekly exchange that has interesting parallels with the Bordeaux en primeur system, writes Jane Anson, investigating the release strategies of the region's chateaux as the Bordeaux 2014 campaign looms. In France, sliced bread is a bigger deal than you might think. Most bread comes as the classic baguette, and the idea of a sliced version seems a little, well, overly sanitized; too easy for this most gastronomic of nations. Going for the sliced option marks you out as a foreigner. I think about this every year when en primeur rolls around, and it’s no different ahead of Bordeaux 2014. The idea of slices, or tranches, is right at the heart of the system. It’s basically very simple. Chateaux release their wine in stages, with the first slice being the most attractively priced, and subsequent slices going progressively higher. The smart money goes for the cheapest first slice, where the potential rewards of buying en primeur are inevitably the highest. But just like in the boulangerie, its simplicity masks a whole host of other factors, and is a much bigger deal than you might think. In theory, the first tranche is the most alluring aspect of the whole system. The very point of its existence for wine lovers is to get a good price as a reward for paying upfront for bottles that won’t be delivered for two years. Done properly, releasing in slices can drive up excitement and provide a real incentive to buy. Recently, it has been taking something of a hammering – particularly for the Bordeaux 2010 vintage, when large numbers of chateaux released three or four slices of stock, pushing each one higher to ever more giddy prices. The tranche system imploded at this point, because anyone who bought the later tranches of most estates is currently sitting on a big loss, and the sheer naked greed that slices can provoke on the supply-side was uncomfortably exposed. So, is it possible or desirable to get it working again? And most importantly, how do you as a consumer get your hands on the fabled first slice? Well, it’s complicated. For a start, every chateau has a different approach, and some never do it at all. Other chateaux, such as Lynch Bages, try to release all their en primeur wine in one slice, representing around 85% of their production. They will then only release the remaining 15% several years later after ageing it at the chateau, and then perhaps only in small batches, priced according to the current market conditions. Last year, however, with the 2013 vintage, Lynch Bages managed to grab pretty much all of the headlines by releasing one small slice (owner Jean-Charles Cazes wouldn’t tell me exactly how much, although several merchants confirmed that their allocation dropped by around 65% on the year before, so draw your own conclusions from that) at a very reasonable price of €50 ex-Bordeaux; a 17% drop on 2012. It might not sound inexpensive, but was a very smartly priced wine compared to what was available on the market – and it went against the cynical idea of releasing a small amount at a high price to capitalise on rarity. It’s a tricky subject to call. The traditional view is that slicing your release into tranches only works if you have a big enough name for people to get excited, or if it’s a particularly good vintage and the demand is high. If so, you use your first slice to test the price, and then head upwards as far as the market will bear. Nearly every chateau I spoke to said they had done it only a few times in recent years; namely for the highly rated 2000, 2005, 2009 and 2010 vintages. Only the (1855) First Growths will regularly use the escalating price system – but they all told me that their exact strategy is commercially sensitive and weren’t prepared to go on the record. My feeling is that the tranche system only works when it is used as a reward. As 2010 showed, the escalating price approach is about the chateau, not the consumer – and consumers can see it a mile off. Far better, surely, to take the Perse approach, or the Lynch Bages approach in 2013; release a certain amount at a genuinely good price, then at a later date (I like the idea of it being at bottling, when the chateaux want to be clearing out their cellars anyway) release the rest at a slightly higher price – a simple, two-step process that offers a genuine reward for early purchase. And the lowest price has to be made available for consumers – too often negociants and merchants end up holding back wine until all the slices are released, and offer an average price to the final consumer, thereby missing the whole point and seriously shortchanging the wine drinker. Taste 2005, 2009, 2010 – Bordeaux’s greatest vintages in recent memory. 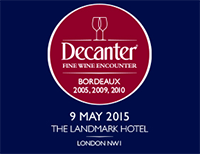 Join us at our Decanter Bordeaux Fine Wine Encounter on 9 May at The Landmark Hotel in central London. Click here to book your tickets for the Bordeaux Fine Wine Encounter.